I'm frequently asked for corsets for under wedding dresses, so I thought I'd kick off the blog with some information on them. Well usually it's because the client needs bust support and doesn't feel confident in a strapless bra. Having the support come from the waist helps tremendously. It can also be simply because the bride has tried laced up dresses and likes the feeling but has opted for a dress without it. It can also solve other problems such as fit and shape. And of course, it can just be because it looks great! How will it work with your dress? Well, one myth you will hear is that you can't wear a boned undergarment with a boned dress. This is not true. I wouldn't advise wearing basque with cheap plastic boning under a boned dress, because the bones will bow out the way and clash with the dress bones. But a proper steel boned corset should be absolutely fine. Think about period gowns! The Victorians wore corsets underneath boned bodices, and they knew what they were doing when it came to big frocks! Secondly, it takes the strain off your dress. 'Corset' back dresses are not corsets. They are laced usually with loops and ribbon or turned tubes of fabric. There is no strength there. Lots of brides (and bridal shops) try to yank them tighter and only succeed in bursting the loops. More expensive dresses may have an inner corselette which does some of that work but if not a corset will do even better. Your dress will be supported by the corset, and it will make full skirts much more comfortable as the weight is spread over the structure of the corset. Third, it can increase the impact of your dress. Often we try to recapture a style.. such as that 50s full skirted movie star look, or perhaps a curvaceous Edwardian rollercoaster. Those shapes required corsets, even on those perfect golden age movie stars. So trying to recreate it without one is an uphill struggle. I would certainly advise you to wear the corset beforehand and also to keep in mind that you have to eat, drink, dance and ensure the corset allows for that. You may find too much champagne isn't such a good idea.. bubbles and corsets don't really go. On the flipside, the back support and general all over holding up of a corset can be a real benefit when you have a long day, and much of it on your feet. Some wearers even find it helps with anxiety, as the feeling of an all over hug and the compression can be comforting. A corset is not the answer for a backless dress, especially for full busted brides. There still needs to be support across the back for anything to give you proper bust support. If you really want a back focus and you have a big bust then consider a feature back or illusion mesh. That way you get effect but are comfortable with not last minute stresses. It's also not necessarily a fit solution for your dress. A corset will change your shape, pulling your waist it, flattening your stomach and smoothing your hips. But, it will create a firm shape with no squish so the dress has to fit over the corset and to the shape, and it won't compress the corset. You need a corset that works with the dress. Very antique Victorian shape usually don't work as the bust shape isn't right for underneath a modern dress. Stays aren't ideal under anything other than very specific styles (think Vivienne Westwood). The best shapes are cupped or gored busts. But a lot depends on you, and your dress. One of the best reasons is it takes a lot of stress off about body size change. The corset is going to give you a consistent shape unless you dramatically go up or down. 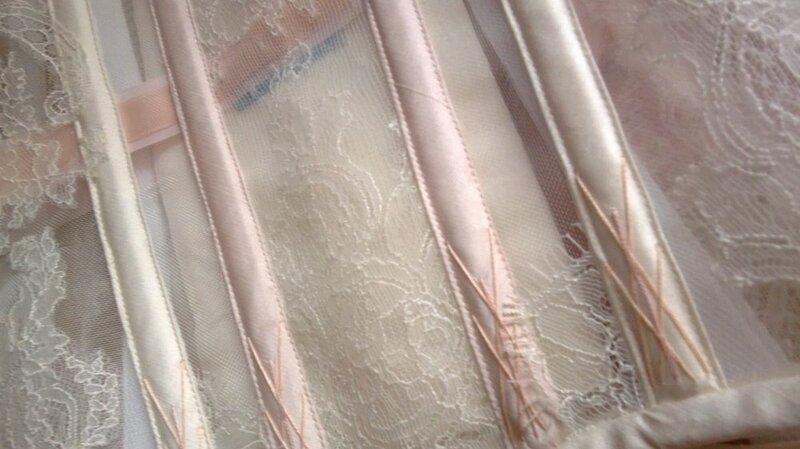 So if you're considering a corset for under your dress, get in touch and we can discuss options. It can work incredibly well and give you an amazing shape after the wedding too of course!